Posted on April 28, 2017 April 28, 2017 , in Hot Tubs. When shopping for a hot tub, it’s easy to become mesmerized by high-tech features and options, but it’s just as important to pay attention to basics like insulation and energy efficiency. Below you’ll learn why insulation is so important and how you can save money by choosing an energy-efficient hot tub. 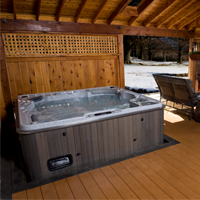 When hot tubs first became popular, they utilized foam insulation to lock heat in. While foam was effective, it created problems during service calls because the plumbing under the hot tub had to be dug up to provide repairs. As hot tub technology advanced, manufacturers found new ways to improve insulation. Insulated walls that were able to lock in waste heat from piping and wells was a major advancement, but these systems lacked air flow which caused the cabinet to overheat. They were also not sturdy enough to fully support their plumbing systems. Today’s best manufacturers have found a way to retain heat, provide support, and save you energy. For example, Hydropool’s Hydrowise Triple Thermal Shield System locks in cabinet waste heat and features thermal vents that allow hot air to escape and prevent overheating. • Heat-Locking Technologies: These features allow your hot tub to reuse waste heat from the motor, heating your hot tub during cold weather. • Adjustable Vents: This feature allows you to release heat during warm months, conserving energy and preventing your hot tub from overheating. • CEC Approval: Hot tubs that are Commission for Environmental Cooperation approved are the most energy-efficient hot tubs on the market. • Fast Filtration: Hot tubs that filter their water more quickly provide greater energy efficiency. • Hard Cover: Choose a 3- to 4-inch tapered cover that has insulated bumpers. This will seal heat in. • Cabinets and Flooring: Be on the lookout for sealed cabinets and plastic flooring, both of which improve energy efficiency. Now that you have tips for how to find the most energy-efficient hot tub, download our buyer’s guide to see our many energy-saving models.